I know a lot of you have passed Miramar Square many times, probably daily at the busy intersection of Flamingo Road and Miramar Parkway. That is very close to my neighborhood of Vizcaya, so I am a regular. I shop at Kohl's, get my hair cut at SuperCuts, and have checked out the other businesses as well. What I didn't know or ever see before is the Miramar Green Market. From 9 am until 3 pm on Saturdays, there will be an open market where you can buy fruits, vegetables, baked goods, plants, flowers and other items. The Public Relations firm for Landlord Woolbright Development put out a press release announcing the weekly event just a week ago, so perhaps that is why I've never seen it before, despite passing there every Saturday for years. The press release states that they expect to start with 8 vendors and increase to around 20 vendors. I'm pretty excited about the whole thing. I love a good open market and I love my community! Now, I know you are wondering where the photos are. Trust me, if I could have lifted them from another site, I would have done that! However, I will do my best to get some shots in the next few weeks. But how about you send them to me in the meantime to CityOfMiramarFlorida [at] yahoo [DOT] com? I will publish them right away. 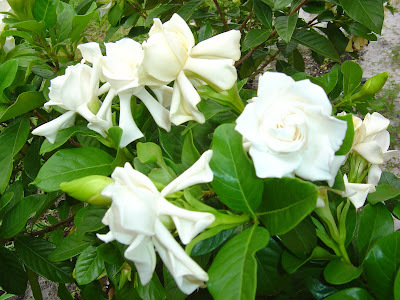 Anyway, the flowering Gardenias above are from my back yard and have nothing to do with this green market. They are just beautiful and smell delicious! After you are done picking out the best tomatoes and orchids or whatever you desire, take a moment to check out the rest of the tenants in Miramar Square. Thanks. Let me know your experiences.